It’s almost Black Friday folks, and everyone is already starting to rush stores. You don’t want to be caught in a huge mob, right? We, here are at LureOfMac, have scoured the web and found the best 6 Black Friday iPhone apps to help you avoid people and clusters of people. Every minute counts, every dollar is important. Sure, you can listen to TV ads, or be bombarded by deals at the radio, but that’s just disorganized and you’re better than that. And you can clearly do better with the following iPhone apps. They are all free apps and are designed to help users get the best deals. These apps have a close relationship with thousands upon thousands of retailers all across the country. Black Friday FM doesn’t just scout and scans stores. It offers in-depth information and perspective that actually helps the buyer – better yet, the potential buyer. Black Friday FM works almost the same way as their official website. They provide essential information that help buyers understand how sales are announced, what stores are competing with each other this Black Friday, and why some deals aren’t promoted through adverts. As you can see, the app is quite easy to use and it has a bright colour palette. It tracks and analyses Black Friday ads, and keeps them updated. It even showcases leaked ads and other special events. You can search by store, or category. There’s a cart option where you can select items and put them in a sort of wish-list. It’s available for iPhone and iPad. The TGI Black Friday 2015 app has partnered with DealCatcher, a humongous community, which helps shoppers all across the country find, sort, and share deals from over 10.000 categories and discounts. According to the official website, at least. It has one strong goal: they want to offer the best, the freshest, and the most popular deals, coupons and discounts this Black Friday. You can sort them either by shopping or store category. The app collects coupons from Target, Groupon, Barnes and Noble, Amazon, Best Buy and it offers direct links to the discounted items. You can select to sort products by popularity or price, and it also lets you make a favorites list. You can immediately share deals and set up a notification system so you never miss a deal. Take a look at this awesome app and its website. When you first launch the app, it will display the latest scanned ads. At the upper left screen, you’ll see a listing pane that users can choose to select categories such as: News, Deals, Stores, Wishlist and About. 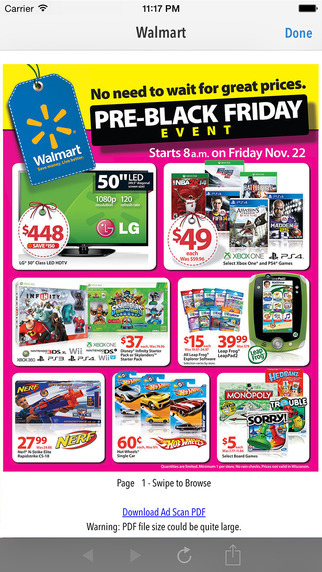 Black Friday Shopping isn’t just super useful for this Friday event, but it has deals, discounts, coupons year-round. It’s associated with about 200 online retailers – including Groupon. You can search by keyword, price or store, and even sort and compare prices. It’s speciality is Black Friday deals and it’s available for both iPhone and iPad. 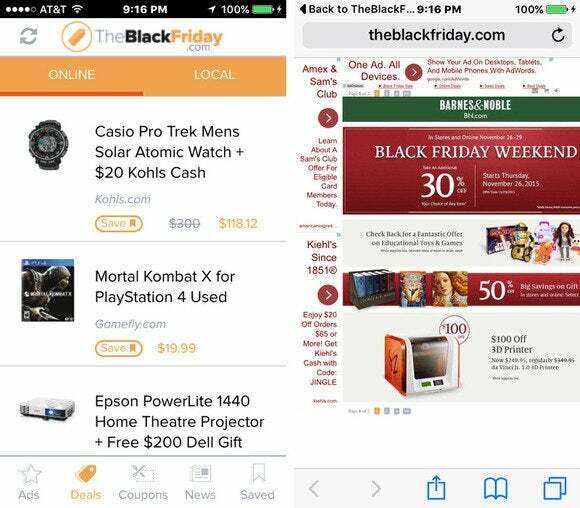 It resembles the Deals of America app, but it’s main focus is Black Friday deals. This app asks your permission to pin point your location in order to give the best deals that are closest to your area. You can choose to manually enter your ZIP code if you don’t fancy letting your smartphone, or some strange app, know where you reside. There are a ton of Black Friday apps, so be sure to check which is which. This one is powered by DealNews and is paired with the official DealNews app. According to the website, they rank up discounts, deals and coupons from over 2.000 online retailers. Before it displays it to its user-base, it first checks if the deal is valid, if it has the lowest price for that product and if the retailer is a trustworthy source. Users can search by merch categories, stores, deals, and even read advice from expert e-commerce writers, buyers and journalists. Black Friday 2015 by BuyVia is quite awesome as it notifies the user if he is in a vicinity of a store that has super deals or discounts going on. It alerts you of whatever local sales or online deals shoppers have discovered. You need to check an item or store first, and then the app will send you personalized notifications until you shut it off.